Which are the top best water purifiers in India? Some may ask what qualifies me to make such a selection of water purifiers. I get this question many times, so I have made an 'About Me' page on this website. To summarise: I am a 73-year-old grandfather, a retired graduate Mechanical Engineer, worked in the water purification industry in Dubai for almost 40 years in a Company installing large Reverse Osmosis Plants to convert sea water into drinking water. Built up a leading Company in Dubai specialising in water purification and retired as the CEO. We were also one of the largest Companies in the Middle East importing and distributing home water purifiers from all over the world. I have an intimate knowledge of the Indian water purifier industry, having interacted with many of their senior executives who wanted me to import into UAE their water purifiers. So, in short, I think I am qualified enough to give advise on Indin water purifiers. The logic I have used in selecting the best water purifier in India is quite simple. With all my years of experience with water purification, I have concluded that for home water purifiers, the best available technology is Reverse Osmosis or RO. 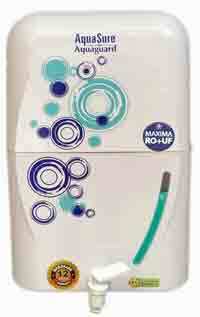 I have explained in several pages on this website why RO water purifiers are the best. So in my selection of the top 10 best water purifiers in India, only RO water purifiers find a place. 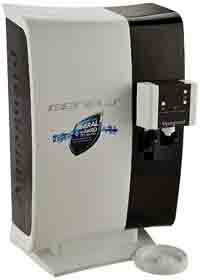 The main criteria I used for ranking the water purifiers in the top RO water purifiers is reliability and the price. So my selection of the best RO water purifiers consists of simple non-complicated water purifiers without too many additional features. UV in RO water purifiers is not essential, though it won't do any harm. In my list of the top best Water purifiers here I have chosen a non-RO water purifier, the Whirlpool model Destroyer Water Purifier. 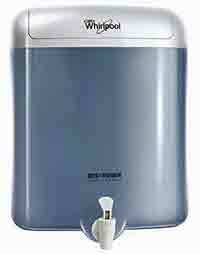 The Whirlpool Destroyer water purifier is as good as an RO water purifier for ordinary tap waters supplied by Corporation and Municipalities in major cities in India. The maximum TDS the Whirlpool Destroyer can handle is 500ppm TDS. Municipality or Corporation water will always be under 500 ppm TDS. The other top RO water purifiers I have selected are from old established and reliable water purifier manufacturers in India. The newer manufacturers in this field may have good products at a lower price, but they are not included in my list for now. Last but not least, I have considered the price of the water purifier to give good value for money. The last few water purifiers in my list of best Indian RO water purifiers, are the top of the range RO water purifiers from these old reliable manufacturers. These are the best RO water purifiers in India, but they are also the most expensive, so what gets them to the lower rank is the 'value for money' factor. For those who can afford it, go ahead and buy it with full confidence. But the cheaper RO water purifiers from the first few ranks in the top 10 best RO water purifier list will also give equally good water. The cheaper RO water purifiers will have lower capacity storage tanks, but that should not be a problem for smaller families. At this point I should mention that there is a more modern type of RO water purifier called the Under Sink RO water purifier. In USA, Europe, Dubai and other advanced countries, it is the Under-Sink RO water purifiers that is used. 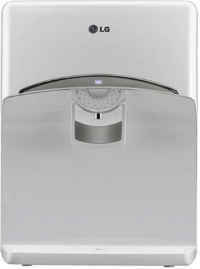 Please visit my page about Under-Sink RO water purifiers for more info. Here are detailed reviews of all the top 10 best water purifiers listed above. 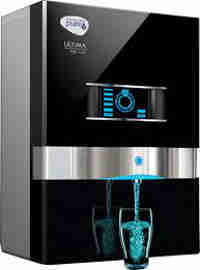 The Livpure Touch Plus water purifier was launched by Indian star cricketer Mr. Sachin Thandulkar on September 2012. Within 6 months of their starting marketing of their water purifiers they won the Water Digest, Water Award 2012-2013 for ‘Upcoming Innovative Domestic Water Purifier - Best RO+UV+UF Category’. 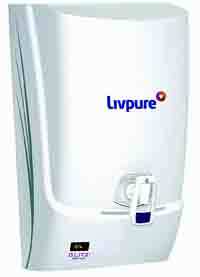 Now Livepure has become a famous and reliable water purifier brand in India. This is the unique design of Kent RO water purifiers that made Kent water purifiers a houshold name in India. It is a tried and tested design and the purifier will be very reliable. With 9 litres of purified water storage it should be more than enough for a medium family and small offices. Advanced 6-stage Purification through RO+UV, Digital Advance Alert System to alert about GermKill Kit 15 days before its end of life. Purity Indicator to Constantly monitor the quality of input and output water. 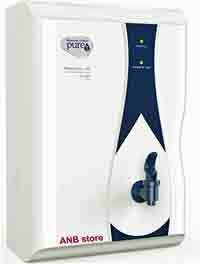 Pureit RO water purifiers are made by the famous Hindustan Unilever Company (HUL) in India. The Pureit Ultima RO Water Purifier has an additional drinking water sanitizer called 'Germkill' which has a 'programmed chlorine release technology' to target and kill all harmful viruses and bacteria and provide pure drinking water. There is an Advanced Alert System that lets you know some days before the special GermKill cartridge in it stops working. This way, you actually have enough time to act and be ready with the replacement. Other features like the Neon Flash Belt that lights up whenever the water purifier is used. In addition, the TDS modulator improves the taste of your drinking water. The Aquaguard model Geneus RO+UV Water Purifier from the famous Eureka Forbes Company has a 7-Litre pure water tank. 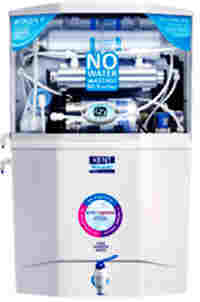 This Aquaguard Geneus is the top of the range Aquaguard water purifier and therefore should perform very well and you can expect priority service from Aquaguard. RO+UV+UF+TDS Control; Smart RO with KENT's Mineral ROTM Technology and real-time monitoring of purity, performance and service history; interactive touch screen display to monitor RO flow rate, balance filter life, RO pump status, time, purified water quality, etc. 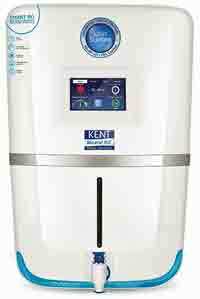 The Kent model Superb Smart RO Water Purifier from the highly popular Kent Water Purifier Company has a 9-Litre pure water tank. 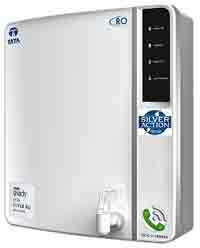 This Kent model Superb Smart RO Water Purifier is the top of the range Kent water purifier and therefore ther should be no worry about the performance of the water purifier and also Service from Kent for the top Kent water purifier model will be prompt. LG RO water purifiers claim that LG uses Stainless Steel tanks (SS tanks) because bacteria does not grow on the Stainless Steel tank surfaces as they do on plastic water tanks of ordinary water purifiers. LG RO water purifiers also have periodic UV light sterilisation of the stored water to prevent bacterial growth inside the SS water tanks. The other unique process they have in their water purifiers is the 'Electrolysis Sterilizing Care', etc. details of which are explained in our page on LG water Purifiers.